Seattle, Washington is home to such a wealth of breweries, taprooms, and lush waterfront scenery that you’ll want to take your time savoring all of the above. Put on your finest flannel, pull up a barstool, and let us pour you a pint. “It’s like family, but with better beer!” The man at the bar laughs as he tosses me an answer to my question, “Why do you come here every day?” His status as a regular was cemented when Geaux Brewing moved in down the street and started serving him the best beer he’d ever had. “Family, but with better beer” is a summation of most of the beer culture in the Pacific Northwest. Good-natured one-upmanship coupled with the lion’s share of the world’s best hops fields is a combination resulting in world-class beer and the first-rate people to go along with it. Navigating this beautiful Pacific Northwest city can be geographically tricky, due to the clean bisection Lake Washington provides to the Seattle Metro area. Just two bridges, one of those being a toll road, offer the only means of crossing the giant lake that lives right in the center of the area. The up-and-over method of getting around the lake will take you far north of the city, and going around it on the other end will take you far south. Both options also offer a smattering of fantastic breweries, a bit of a cultural apology for the inconvenience. The abundance of beer, brewers, and hops in this area leaves you no shortage of haunts to hit, regardless of the region of Seattle you’ve landed in. The undisputed king of the Seattle beer scene, the charming Ballard/Fremont section of Seattle boasts the most breweries and beer bars per square mile in the state. Most of the destinations are within walking distance of each other, but you may need more than one day to hit them all. If you choose just one area of Seattle to visit, this will most likely be your best bet. First stop: Fremont Brewing. One of the fastest growing breweries in the state, it’s become a favorite of locals and is constantly packed to the rafters with patrons. Fremont is well-known for its innovative and delicious combinations poured through the two Randalls that are in frequent rotation. Just down the street, Brouwer’s Café is a must-visit for beer fans. With sixty-four taps, an extraordinary 300-bottle list, and a full schedule of beer events, this is a destination for local (and visiting) craft-beer fans. Less than a mile away is the impressive Reuben’s Brews, a brewery so well loved by Seattle beer fans that they brewed the official beer for this year’s Seattle Beer Week. With a Randall program just as impressive as Fremont’s, as well as several GABF awards under its brewing belt, Reuben’s is a beer experience that you shouldn’t miss. Steps away lives another lively taproom that has earned its mark as a go-to destination. When biologist and cicerone Robyn Schumacher teamed up with her equally science-and-beer-obsessed friends Lara Zahaba and Brad Benson, the union formed Stoup Brewing, one of the most impressive beer spots in Seattle. Equal parts flavor explosion and beer-science innovation, Stoup is a brewery to watch. Travel south of Fremont and you’ll find yourself in the Queen Anne neighborhood, a small but chic community with upscale homes and a growing beer scene. Stop in for a pint at Holy Mountain Brewing, the current cool kid on the Seattle brewery block. When Holy Mountain decides to host a beer-pairing dinner, it sells out in minutes. Make sure to grab a sought-after bottle while you’re there, as they are hard to come by. A few miles away is The Pike Brewing Company. If you’re the sort who wants to stop into Pike’s Place Market and watch the professional fish throwers, then pop in next door for a pint. 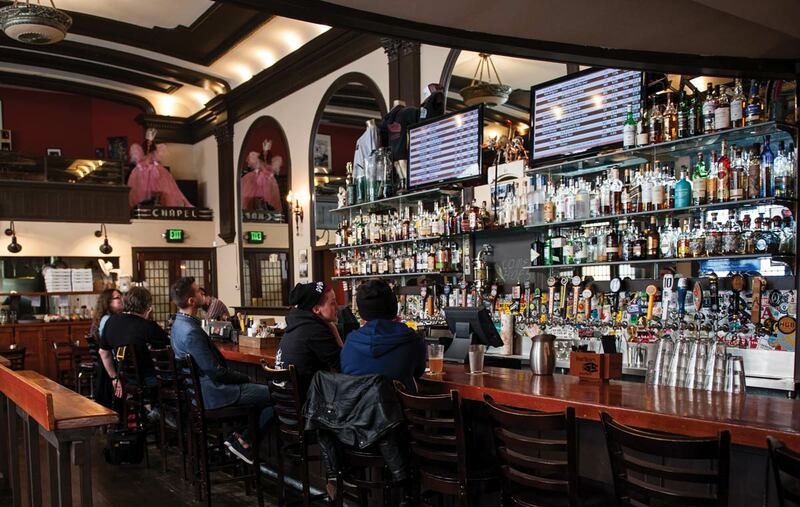 Pike’s has been serving beer to Seattle locals and tourists since the 1980s and has earned a soft spot in the craft-beer-loving hearts of Washingtonians ever since. Once you’re brave enough to fight Seattle traffic, head over to The Pine Box (above), which was established by the founder of Seattle Beer Week and the former bar manager of Brouwer’s Cafe. The Pine Box is housed in a former mortuary (hence the name), and pours a well-curated beer list from its thirty taps. The Pine Box also hosts beer events regularly, so keep an eye out. For a proper meal and a great pint, stop into Mollusk Brewing for the best of both worlds. Mollusk rose from the ashes of Epic Ales, a favorite brewery around town that closed far too soon. Mollusk opened to a sigh of relief from the locals and offered the same fantastically weird beer that they’d gotten used to. Next, it’s time to stock your beer fridge at one of the most well-trafficked and well-stocked bottle shops in town. With regular food trucks, a taproom, and a crowd of beer geeks in attendance, Chuck’s Hop Shop (pictured at top) is more than your average bottle shop. Look for bottles you can’t find anywhere else in the city, order a flight, and grab a bite at the food truck parked outside. While the west side of Lake Washington is best known for its beer scene, the other side of the lake is no slouch. Traveling north of the city, and over the top of the lake, the first spot you’ll hit is Hellbent Brewing Company (above). Founded by a collective powerhouse of GABF award winners, long-time bar managers, and beer geeks, this is a place that has a soul much older than its gorgeous, newly opened taproom. Especially on sunny days, the patio itself is worth the drive north. Next stop: Woodinville. Just northeast of the top of the lake sits what locals think of as “Washington’s Napa.” With a huge supply of wineries, distilleries, and breweries, this is a booze lover’s paradise. Check out Triplehorn Brewing Co. and B-Side Brewing in the industrial district, Dirty Bucket Brewing Co. down the road, and then on to Foggy Noggin Brewing. If you get weary and hungry, head over to The Collective On Tap for some delicious barbeque and a well-stocked tap list. Monday nights are brewer’s night, featuring a new brewery every week and a Q&A with the brewer. Travel farther south and you’ll hit Redmond, were the locals will insist you stop at Black Raven Brewing Co., a brewery with rapid growth due to a catalog of consistently good beer, as well as a regular rotation of new and innovative brews. From there, head down to Bellevue and check out the small hidden gem of a brewery called Geaux Brewing. With everything from an impressively delicious summer ale to a smoked ghost chili porter, this is a place that will please even the pickiest of beer snobs. Make sure to take some of that beer home in a crowler—they will seal one for you right on the spot. SoDo is how the locals say “South Downtown,” and it’s also home to more than a few great breweries. Two Beers Brewing Co. has been an ever-expanding brewery making waves in the SoDo beer scene since 2009. Yes, there are more than just two beers, but their motto is “Life is just a little more honest after two beers.” Can’t argue with that. Then head over to the beloved Georgetown Brewing Co. for a taste of Seattle’s own Lucille IPA, a sentimental favorite of those who cut their craft-beer teeth in the Pacific Northwest. Georgetown doesn’t bottle and the keg distribution is limited, so grab a growler to go as this may be your only chance to sample a true Seattle brew. The Washington beer scene is one of those you’ll-never-see-it-all-the-first-time-around types of experiences; however, if you have ultimate control over the timing of your visit, the best possible decision you could make is to plan it around the annual hops harvest. After all, Washington State is responsible for almost 80 percent of the nation’s hops yield. Either plan on a day-trip to the Yakima hops fields to enjoy the beauty of fresh hops being harvested right from the bine or come a few weeks later, when the fresh-hopped beers take over the local taprooms. The Yakima Hop Harvest Festival is one-of-a-kind and features fresh-hops beers that are unlike any you can sample elsewhere. But if you can’t leave Seattle during your October visit, make sure to check out one of the many, many fresh-hops tap takeovers that occur all over the state. Find other beer destinations, dozens of beer reviews, and practical advice and tips for getting the most out of your brewing in every issue of Craft Beer & Brewing Magazine®. Subscribe today. Fall beers will soon dominate the shelves, tap lists, and likely our fridges, so you might as well start reaping that fall beer harvest now.